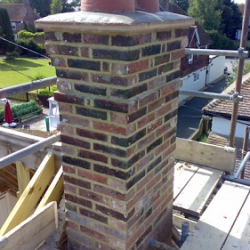 A chimney is exposed to many factors and is especially vulnerable to high winds. 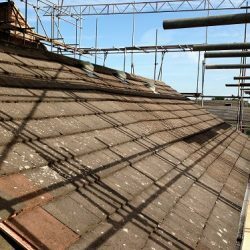 If cracks in the mortar of the chimney are beginning to show then, it is presumably time to get it investigated by a roofing professional. At the utmost, the chimney can fall so don’t neglect warnings of cracks. Chimneys can be near to the edge of a hip roof or in the center of the roof on the ridge. 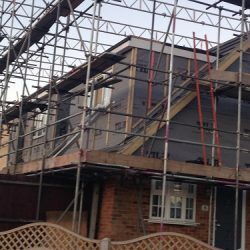 This repair requires clearing out a minimum of 25mm of mortar from all the joints with an angle grinder and then repointing, normally with a 3-1-1 mortar mix (3 parts building sand – 1 part sharp sand – 1 part cement). 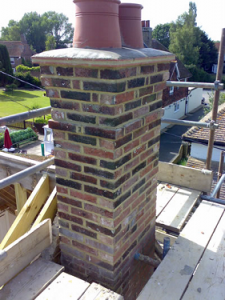 It is also smart to replace the mortar at the head of the chimney (called a haunch) with a 3-1 mortar mix. 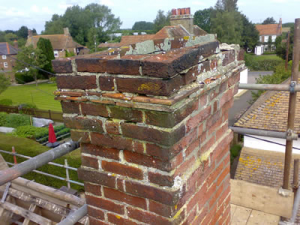 While access is convenient, it may be a good chance to renew the leadwork near the chimney only if it is over 40 years old or is displaying signs of damage. 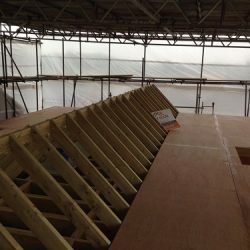 Another job that could be completed at the same time is replacing or rebedding repairing any cracked or loose ridge tiles. When replacing the lead round a chimney, there is normally a back gutter made of lead that needs replacing. Also, the lead soakers which sit under the tiles and bend up against the chimney need replacing as well.